Calling it a cultural explosion brewing excitement around the brand’s 25th Anniversary and the country’s independence, Kalik Beer executives today unveiled plans for the family-friendly Festival of The Bahama Islands, featuring dozens of vendors and live demonstrations and performances by artists, dancers, musicians, craftsmen and storytellers from across the archipelago, as The Bahamas Weekly reports. 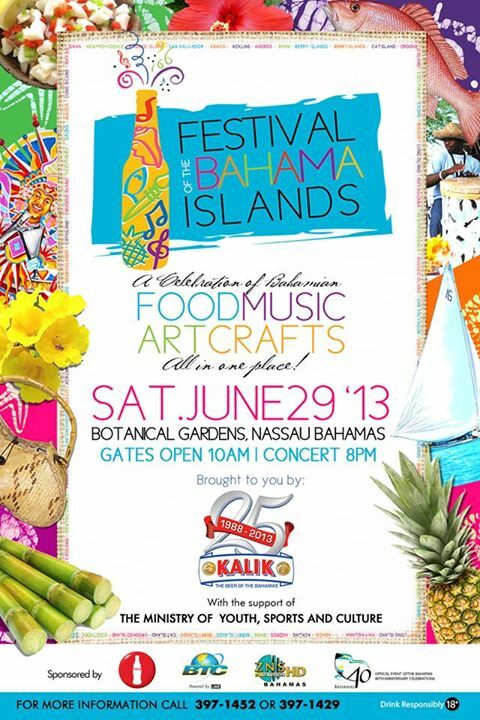 The festival, set for Saturday, June 29, is a departure from traditional Kalik events, designed for local families and visitors to get a taste of the fare, crafts and entertainment of all the islands. An official 40th Anniversary of Independence event, Kalik’s Festival of The Bahama Islands is sponsored by BTC, Coca-Cola and ZNS with the support of the Ministry of Youth, Sports & Culture. The day-long party of “all things Bahamian” will be held at the Botanical Gardens, near historic Fort Charlotte and Clifford Park, a fitting backdrop for this year’s commemoration, organizers said. “Kalik’s Festival of The Bahama Islands will celebrate our love for Bahamian music, food and entertainment and offer champions of Bahamian culture opportunities to showcase their contributions as a part of the Bahamian cultural experience,” said Kalik Brand Manager Jannifer Thurston. Timing of the festival was set less than two weeks away from the country’s Independence celebration, while Kalik is also celebrating a birthday of its own with a silver 25th anniversary. Thurston sees the dual celebration as added excitement for the first-ever event. Doors open at 10am with the celebration’s official kick-off at 12pm. Tickets are $5 for adults and $2 for children under the age of 12 for a full day of Junkanoo music and costume building demonstrations, quadrille dancing, jewelry making, painting, percussion musical performances, fashion shows, bush tea demonstrations, crab catching and straw plaiting lessons, Cascarilla bark demonstration and more. The Royal Bahamas Police Force Band and the legendary Lassie Doh Boys are also on tap for entertainment and a concert entitled Celebrating 40 Years of Bahamian Music featuring Tingum Dem an’ Friends is also lined up. The event will culminate with a Junkanoo rush.